I’m excited to show you the first in my new series of drawings. 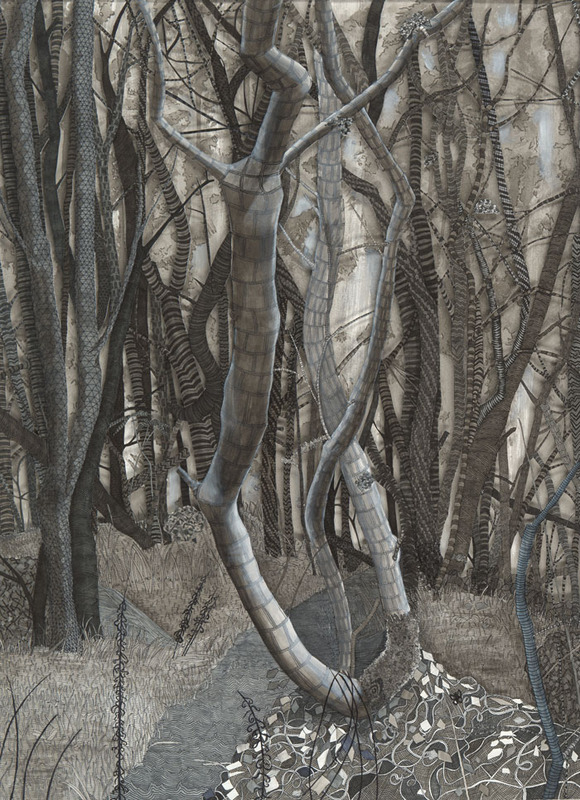 ‘Into the Woods’ is my interpretation of landscape through line and shading. The inspiration for the landscape came from a picture I took while vacationing with friends in Sequim, WA. Even before I painted the portrait of Peter, I knew that I wanted to experiment with the pattern I had been creating for the last year in my line drawings. I wanted to create something that would be challenging for me and intriguing to my audience. This series is my way of connecting my love of pattern and my love of the woods. Each section of this drawing was a new challenge for me, but I had fun experimenting with the use of various patterns to convey shape and form to the objects they were used to describe. This piece is 22×30 and created using archival pens, inks, and felt markers. It has two layers, the negative space has been cut out to let the background show through. As you can see there are shadows of the branches showing through to the background. The layering has been a happy accident and I look forward to adding it to future pieces in this series. This is the beginning of something new, I’m so thrilled to have this piece finally finished! Yay! I will have ten drawings in this series – my new goal. I’m currently working on #3 & #4. Should be posting #2 in the next few weeks. Thanks to Bellevue Fine Art Reproduction for this great digital scan of my work! They did an awesome job!